Exploration and adventure form part of the Swiss genetic make-up, and crows Loïs Robatel and Arnaud Cottet do not deviate from the Swiss DNA model. 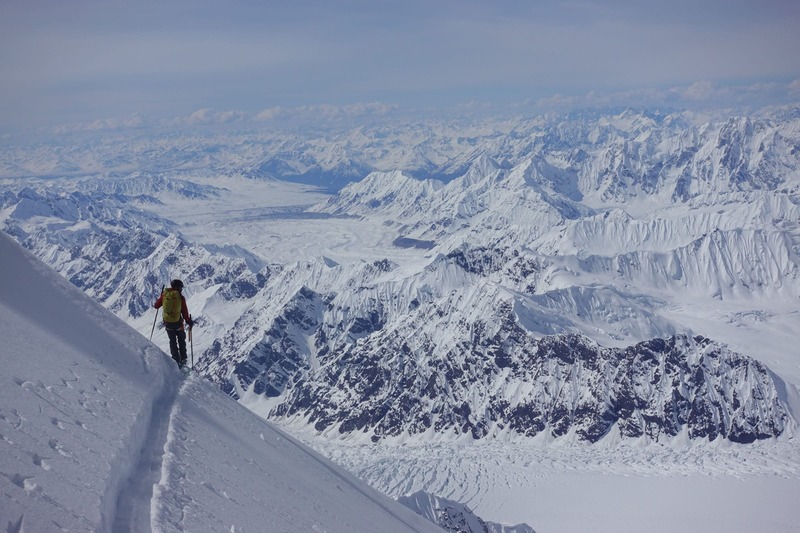 Along with their fellow countryman and film maker Nicolas Bossard, Loïs and Arnaud conceived a ski expedition to the highest peak in Afghanistan: Noshaq, 7492m high and located in the Hindu Kush mountain range. Not content with embarking into terrain highlighted in bright red on all of the ordnance survey maps, they decided to reach Afghanistan by road, emulating an Austrian ski expedition who set out in VW campervans in 1970. On the way, they skied various peaks in Greece, Turkey and Iran before meeting up with Serge Thélin, David Lavie and Nicolas Bossard at the Afghan border. Here is a worldwide web premier, a documentary retracing the adventure, along with an interview with Arnaud and a series of photos captioned by Loïs. BC: How did you get the idea of skiing Noshaq? Arnaud Cottet: It all began when I met photographer Ruedi Flück who suggested we go and do an article on the a href=”http://afghanskichallenge.com/” target=”_blank”>Afghan Ski Challenge (a ski touring comp that’s taken place in the Bamyan province since 2011-ed) for Twin Magazine in 2014. That’s where I met Loïs. We really connected and when we were back in Switzerland touring we talked about going back to Afghanistan to try and do this peak. That very evening we bumped into Nicolas Bossard, a director who we had met in Afghanistan. He asked if we were interested in launching an expedition to Noshaq. That’s how it started, by chance. BC: And recreating the Austrian epic, how did that come about? Arnaud Cottet: We started to do some research on the Internet and I stumbled upon an article from the Alpine Ski Journal about this Austrian expedition in 1970. I searched each of the names and ended up with Karl Gabl. I got in touch with him and met him two or three times at his home in St. Anton. He is full of energy and at 70 years old he lives with a lady who is 35. He’s got it all sorted, it’s inspiring (laughs). He’s a guide and a meteorological router for loads of expeditions and quite a character. BC: And why the road trip? Arnaud Cottet: It was super important for Loïs and I to follow in the footsteps of the Austrians. Karl told us all about his journey and that made us curious to see how the route had developed. We didn’t just want to go there in a plane, ski and come back. We wanted to establish a link to the place and time. So we bought a bus (it seems the Swiss call vans buses..-ed) except now you have a lot of motorway. You can complete it in 10 days if you want. So the rest of the time we thought we’d go and ski in places along the way, in Greece, Turkey and Iran. BC: What were the most memorable skiing moments? Arnaud Cottet: I’d have to say the Turkish Kurdistan area. There’s no one there, it’s completely free and easy to access. 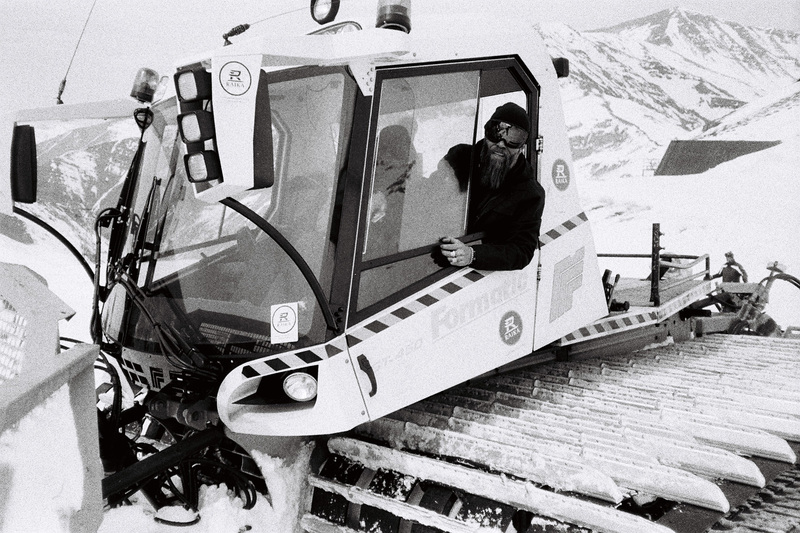 You drive your ‘bus’ up into a meadow and you just ski wherever you want to. It’s so simple. Other than that we started with Mount Olympus at the end of April in a bit of a rush. We met our Greek friend Nikos who had spent the last few years in the Mount Olympus refuge. He led us around and introduced us to all his friends, which meant a lovely ascent and a solid Greek Ouzo session. The snow wasn’t great, we were a bit late, but the view over the sea and the pine forests was amazing. For Damavand, I had climbed it once before in summer. We joined the Club Alpin and went up to the refuge at 4000m. We were stuck in the refuge for a whole day because of the weather, which allowed us to acclimatize. BC: Where did you go after Iran? Arnaud Cottet: We put some road behind us, Turkmenistan, Uzbekistan, Tajikistan…Once we got to Tajikistan we waited for others to join us by plane. We stayed in Dushanbe and went shopping for provisions. We kind of prepared for entry into Afghanistan and then headed for Tajik Pamir. We skirted around the Afghan border on the Tajik side. It takes about 10-12 hours on a 4×4 track before you get to Khorog, the capital of Pamir. From there it’s another 3-4 hours to reach the Afghan border. BC: Afghanistan then, it must be pretty special arriving to that country by road. Arnaud Cottet: You’re driving along the Afghan border for 100-200 Km and you always have this difference, on one side is the communist Tadjik part with infrastructure, a road, ageing but there, and on the Afghan side terracotta houses. Between the two you have the river Pamir. They all know each other, see each other all the time. There are bridges and crossing points that are open one day per week for trade. They all come to buy products from the other side of the border. When you get over there the difference is amazing. You cross a river and suddenly you are in a different world. It’s really weird. It shocked me a lot more than the first time when I arrived in Kabul. BC: How does it go at the border? Arnaud Cottet: It’s deserted. There are two or three soldiers and then you wait. We were the first tourists of the year apparently. They don’t have a problem with the Taliban in that province so safety wise it was cool. But yeah, you do feel like you are in Afghanistan. Then we had to get permits to go into the Whakan valley, access the summit and sort out all the security issues. You have to go and say hello to all the police and army chiefs of the province. They tell you that you’ll be safe. They show you their guns. After closer inspection you realize that half of them are broken. BC: From there you set off for the Whakan Valley. Arnaud Cottet: Yep, after 2 or 3 hours on the road you arrive in the village of Quasi-deh, the valley’s starting point for Noshaq. There we slept at Malang’s place, the first Afghan to reach the summit in 2009 with guides from Chamonix. Nico Bessard met him in 2013 when filming Afghan Winter by Fulvio Mariani and Mario Casella. It was Malang’s job to hire the porters. BC: Is that normal for them? Arnaud Cottet: No because there aren’t any more expeditions. We did meet one old boy who remembers carrying for some Austrian and Polish expeditions…In the ‘60s and ‘70s there were loads of people. After that there was war and no one else came for 40 years. It’s picked up again a bit since 2001-2003. There are some tourists but really not very many. As for the porters, most of them are young because from the age of 13 or 14 they don’t have school any more. These trekking days were almost the coolest of the trip. You spend time with the porters and form real bonds with them. They have the same clothes as always but now they have mobile phones as well. That’s a funny contrast. BC: How did you divide up the load? Arnaud Cottet: We bought bags of rice and made loads of 23 kilos. Malang helped us weigh it out. It’s actually really simple because it’s super hierarchical. The head of the village gives the orders and no one talks back. If anyone complains about the weight, he’s sent away. It’s the same for payment. You give all the cash to the head of the village and then he pays everyone. It’s so hierarchical that there’s no problem. No one dares to say anything. BC: Once you reached base camp, how did you start acclimatizing? 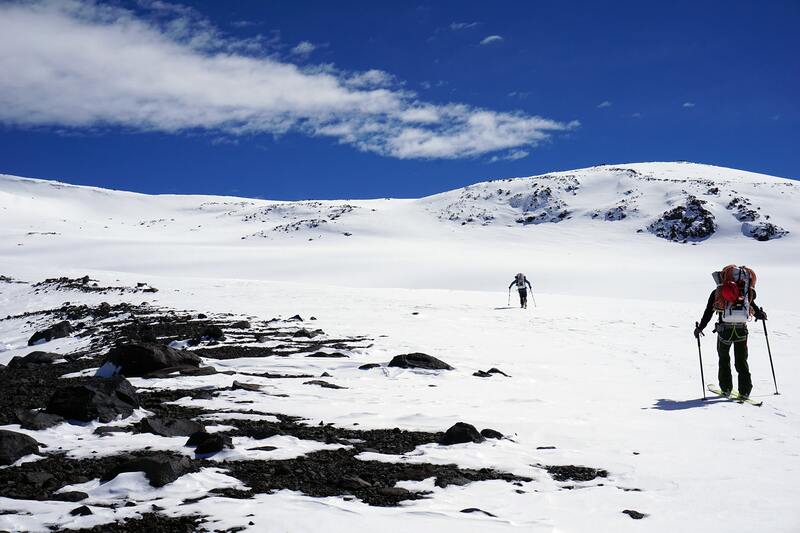 Arnaud Cottet: The mistake we made was instead of acclimatizing gently in another place, we went straight to camp 1. We thought like that we’d bring stuff up, gas bottles, a few other things and if we felt bad we’d head down quickly 2 hours to base camp and if we were fine then we’d spend the night. And that’s when, ascending to camp 1, that it all went wrong. It had been 4-5 days since we arrived at base camp. It was snowing a lot, 20-30cm, and it was melting and snowing again. There was a lot of temperature fluctuations and wind. It was really complicated conditions. We could see it had accumulated but we couldn’t see what was underneath and in fact, it was a great big slab of ice. It was, however the safest way we could see, not being too steep…but it cracked off everywhere. Then it all went quiet. BC: Did everyone get caught? Arnaud Cottet: Everyone except Serge who managed to avoid it. Loïs and Nico got taken but stayed on the surface and David and I were in it. It took me into a hole and when the second slide came down it swept me out of there but David took more snow on top of him. He was under about 1m50 and when we got him out after 10-12 minutes, he was unconscious. We got the snow out of his mouth and he started breathing. It was a close call and in Afghanistan at the ends of the earth… Messing up there is really bad. BC: Looking at the pictures, you were pretty shaken, how did you manage to get yourselves back on the mountain? Arnaud Cottet: The problem was that everything around us became steep really quickly. First of all we went up higher onto the glacier for a night to try and get to grips with a few things. We then returned to base camp and decided to take another route up with Loïs and Serge, an east facing couloir leaving early in the morning when the snow was still hard. We went straight up under a shoulder but the problem was that the shoulder was 200m wide so it didn’t make much difference, a slab could go at any time. We did manage to get to camp 1 though and we stayed one night. It snowed all night so the next day we couldn’t get to camp 2, it was too dangerous. We decided to turn around. We waited for it to purge a bit then went down in the afternoon. BC: When did you decide to flag reaching the summit? Arnaud Cottet: After about two weeks roughly. As soon as we made that decision we did some more mellow stuff and rode a bit for fun before going home. Our problem was that access to camps 1 and 2 was really impossible. There were huge domes of accumulated snow at that time and we would have had to wait 10 days or so for it to pack down, then rush to get to the summit at all costs. I personally think that by the end I was less keen as well. That was the first time I’d really been taken and buried so I was quite happy to leave. The entire journey with Loïs was a really incredible experience so I didn’t want it to be summed up in an avalanche that lasted 10 minutes. BC: Do you want to try the peak again? Arnaud Cottet: No, not really, I don’t think so (he sighs). I really love skiing so in ideal conditions, Noshaq must be incredible. The descent is superb but it’s a one-shotter. It’s three weeks for one run…There are other cool things that appeal to me more. And there’s the cultural aspect too. I really like sharing things with other people. Over there, you’re kind of in the arse-end of nowhere all alone. I can find that in Switzerland. This was all about the summit, the aesthetics of a mountain and I don’t think that’s what motivates me the most. Arnaud Cottet: Yes, I think I’ll go back. It’s a bit difficult right now though. For the mountains it’s really amazing. It’s a really special country. You can’t forget that. Right now though I’m more focused on Iran. I spend a lot of time over there. But I’ve been there a lot so need to make sure it doesn’t just become routine. I’m also happy to be doing other projects. I was in Alaska just then. (Georges, faire lien avec article PIKA, stp). Over there it’s easy, everything works. You book a little plane and it’s ready for you. The guy tells you what day he’s coming back for you and he comes and gets you. And the mountains are unbelievable too. The snow sticks to 60° slopes, which is cool too.